Keep your voice box toasty with this 100% acrylic scarf emblazoned, on its obverse face, with the foreheads of two gnus. 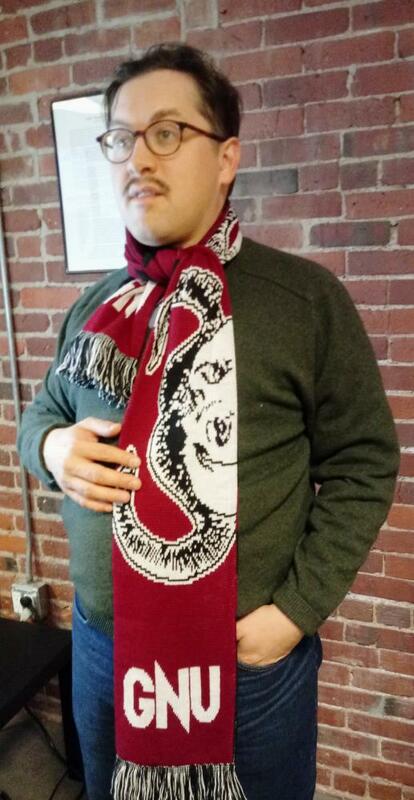 Black and maroon football-scarf-style stripes festoon the reverse face; both sides feature the GNU logo. It's longer than you think - will wrap around most necks folded in half. It's as festive as you hope - both ends terminate in jaunty fringe. Soft, warm, and intractibly committed to spreading software freedom throughout the winter months. This item is a perfect match for the GNU Beanie - buy both and save!